NES Zen: Intergalactic Ninja (USA) in 11:34.21 by feos. The Earth is endangered by global pollution! Zen, the environmentalist ninja of ECO-POWER, must save the Earth from the big defiler, Lord Contaminous. 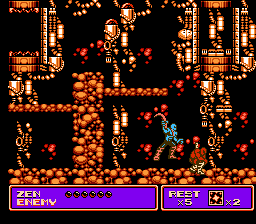 As one of the latest NES games from Konami, Zen featured graphics and music that pushed the limits of the 8-bit console. This movie by feos improves the previous run by 11.28 seconds.